1964 was a big year for Walt Disney, who was preoccupied with the attractions Disney made for the New York World's Fair and production on the most expensive and risky film the studio had ever made, Mary Poppins. Perhaps because he didn't have enough films in production, he chose to theatrical release a two part episode of The Wonderful World of Color as a theatrical feature. 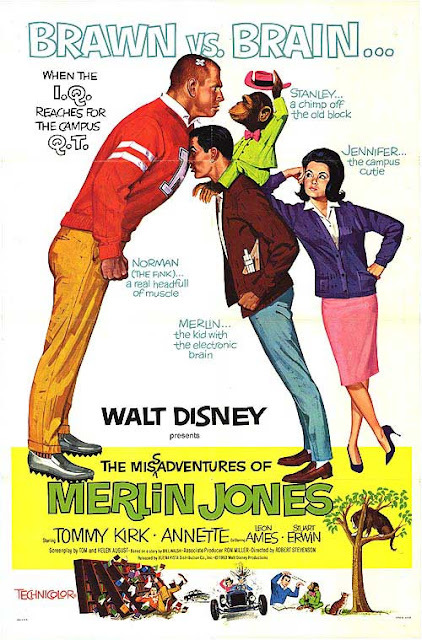 The Misadventures of Merlin Jones, a science fiction comedy in the vein of The Absent-Minded Professor, was originally filmed for television. The film is based on an original idea by Disney story man and producer Bill Walsh, whose credits were many including The Absent Minded-Professor. The screenplay was written by Alfred and Helen Levitt under the names Tom & Helen August due to the fact that they had been blacklisted in Hollywood after being suspected of being communist. Director Robert Stevenson, who had already made a name for himself with films like Old Yeller and The Absent-Minded Professor, directed this film right before moving on to Mary Poppins. Tommy Kirk and Annette Funicello were cast opposite each other, having already performed together in The Shaggy Dog and two TV movies called The Horsemasters and Escapade in Florence. A few familiar faces flush out the cast including Leon Ames and Alan Hewitt (The Absent-Minded Professor) and Stuart Erwin and Norman Grabowski (Son of Flubber). The animated credits were done by X. Attencio and Bill Justice. The Sherman Brothers wrote the title song for the film. After a paper animated title sequence featuring Annette singing the theme song, we are introduced to Midvale College, where Jennifer is being hit on by Norman, the school jock, who she turns down because she is dating Merlin Jones, who is somewhat of a joke on campus for his zany ideas. Merlin's current experiment involves finding out what happens in the mind of a driver. Something goes wrong, giving him the power to hear what people are thinking. When he overhears Judge Holmsby's thoughts about all of the crimes he commits, he and Jennifer dress up as plumbers to sneak into his house and search it, finding lots of crime novels from which they believe he gets his information from. After helping the police catch another criminal, he tells them what he heard the Judge Holmsby thinking, but they dismiss his claims as being absurd. He and Jennifer sneak into his backyard to dig for the diamonds and are caught. The judge explains that he has been writing crime novels under a pen name and what Merlin heard were his thoughts of the plot of his most recent book and Merlin's power of reading minds wears off. In the second story, Merlin's science professor hypnotizes him and has him kiss "the first pretty girl he sees," which isn't Jennifer causing them to get in a fight. He experiments by hypnotizing his cat into thinking its a lion. He then hipnotizes Stanley the chimpanzee from the psychology department to stand up for himself against Norman, who isn't nice to Stanley. The chimp gets in trouble for striking Norman and the situation is brought before Judge Holmsby. He asks Merlin about hypnosis for a novel he wants to write in which the main character is unaware that he is a criminal because he is hypnotized. When Merlin tells him that subjects don't commit crimes outside of their moral code while under hypnosis, he asks Merlin to try it on him. So Merlin hypnotizes him and asks him to steal Stanley from the school. When he actually does it, Merlin tries to sneak Stanley back into the school and is caught. Judge Holmsby has no recollection of stealing the chimp, but is reminded during the trial and Merlin is off the hook. The Misadventures of Merlin Jones was released on January 22nd, 1964. Critics were confused by the two separated plots and instantly recognized this as two unaired episodes of The Wonderful World of Color. They felt that the quality was poor for a Disney film and that none of the actors seemed interested. However, their harsh criticisms were lost on the movie going public and the film grossed $4 million, which is not bad for a live action comedy, especially one made on a TV budget. A sequel was made in 1965 called The Monkey's Uncle and the original was rereleased in 1972. It never aired as part of any of the numerous Disney Sunday night movie series, but made its home video debut in 1986. While the format of two separate, unconnected stories strung together doesn't give the film great flow from start to finish, I think critics were much too harsh on the film. Obviously audiences did as well and its easy to see why Merlin Jones was a hit. Even today, it has many funny moments and its hard to not like Tommy Kirk and Annette together. This was originally meant to be the last Disney film for both. Annette had become famous for her more sexual roles in beach movies and no longer fit the Disney image. Tommy Kirk had been outed as homosexual in an era when it was exceedingly taboo and risky for a family friendly company in the 1960's to remain associated with him. Neither of their contracts were renewed for these reasons. When the film became a success, they were brought back for the sequel, but without contracts for future films. The Misadventures of Merlin Jones is currently available on DVD. The film is presented in fullscreen, which may be the filmed ratio since this was originally meant for television, however by this time Disney often filmed even TV content in widescreen. Exhibitor guides didn't give instructions on how to present the film, so if this is the filmed ratio, some theaters may have displayed it this way while others would have matted it to widescreen. Disney hasn't said which is correct. Bonus features include a gallery of publicity images and a video gallery of Disney's fictional inventors, which for some odd reason doesn't include Merlin Jones. The film is also available on iTunes in fullscreen without any bonus features.